Neglecting the possibility that fossil fuel reserves can become ‘stranded’ could result in a ‘carbon bubble’ as fossil fuel firms become overvalued. This column studies whether banks price the climate policy risk of fossil fuel firms. Prior to 2015, banks did not appear to price climate policy risk. After 2015, however, the risk is priced to a certain extent, especially for firms holding more fossil fuel reserves. The 2015 Paris Climate Agreement to limit the rise in global warming to 2°C compared to pre-industrial levels requires massive reductions in CO2 emissions in the next decades and near zero overall greenhouse gas (GHG) emissions from the next century onward. The limiting of total carbon emissions will leave the majority of fossil fuel reservesas ‘stranded assets’ (Carbon Tracker Initiative 2011, 2013, McGlade and Ekins 2015), with companies owing fossil fuel unable to use most of their reserves. The large fraction of potentially unburnable fossil fuels poses substantial financial risk to fossil fuel companies. Nevertheless, fossil fuel firms still largely invest in locating and developing new fossil fuel reserves (Carbon Tracker Initiative 2013). This ongoing investment, together with the already large fraction of potentially stranded assets, suggests that financial markets neglect the possibility that fossil fuel reserves become ‘stranded’ resulting in a ‘carbon bubble’, i.e. that fossil fuel firms are overvalued. The potential effects of a carbon bubble on financial stability have been recently discussed in the academic literature (Weyzig et al. 2014, Schoenmaker et al. 2015, Batten et al. 2016) and are increasingly appearing on the agenda of regulators and supervisors (Bank of England 2015, Carney 2015, ESRB 2016). However, there is no clear evidence if whether, and to what extent, investors price the risk of unburnable carbon. Studying equity markets, recent research identifies an insignificant impact of climate/technology news on fossil fuel firms’ abnormal returns (Batten et al. 2016, Byrd and Cooperman 2016). This insignificant impact could be due to investors’ difficulties in assessing credible future climate policies and their impact on carbon-intense sectors, to investors believing in climate policy inaction, or to already accurately priced risk of climate-related stranded fossil fuels (Batten et al. 2016, Byrd and Cooperman 2016). Thus, we are missing insights into the effect of climate policy risk on the pricing of financial products. Is there a carbon bubble in the corporate loan market? In a recent paper, we provide the first evidence for climate policy risk pricing, using evidence from the corporate loan market (Delis et al. 2018). Carbon-intensive sectors are largely debt financed, implying that the impact of stranded fossil fuels can easily spill over to the banking sector. This almost naturally generates the question of whether banks consider the risk that fossil fuel reserves will become stranded when originating or extending credit to fossil fuel firms. Essentially, this implies that if banks thoroughly consider the risk of climate policy exposure in the pricing of corporate loans, then no carbon bubble exists in the credit market. Ideally, our main explanatory variable illustrating climate policy exposure would be the amount of stranded assets of a fossil fuel firm. However, such detailed estimates are not available. In principle, a devaluation of fossil fuel reserves can be caused by changes in regulation (policies), technologies, or carbon prices. Climate policies involve direct environmental regulations (e.g. pollution outputs and inputs) as well as stimulating the development of alternative technologies (for example, by subsidising instruments. The probability of stranded fossil fuel reserves is thus higher in countries with higher climate policy stringency. Therefore, we proxy the risk of stranded fossil fuel reserves by the risk of climate policy stringency, i.e. whether a country places considerable effort in climate change policies. A fossil fuel firm owing exploration rights for reserves in a country with strict climate policy faces a higher probability of reserves being stranded than a firm with fossil fuel reserves in a country with loose climate policy. This implies that we require information on the total amount of fossil fuel reserves of firms across countries. As these data are not readily available in conventional databases, we hand-collect them from firms’ annual reports. Some firms hold fossil fuel reserves in more than one country, so we construct a relative measure of reserves for each firm, in each country, and in each year. Finally, we generate a firm-year measure of climate policy exposure (risk) from the product of relative reserves and either one of the Climate Change Cooperation Index (C3I) by Bernauer and Böhmelt (2013) or the Climate Change Policy Index (CCPI) by Germanwatch. These country-year indices, respectively available for the periods 1996-2014 and 2007-2017, reflect environmental policy stringency and thus risk. Note: The cost of loan in basis points is defined as the loan spread plus any facility fee. Our baseline analysis compares the loan pricing of fossil fuel firms to non-fossil fuel firms and the loan pricing among fossil fuel firms based on their climate policy exposure. We strengthen the validity of this model via the fielding of many control variables and fixed effects (e.g. loan type and purpose, bank*year, and firms’ country fixed effects). As relevant environmental policy initiatives are recent, our analysis covers the period 2007-2016. We identify further differences in loan pricing by comparing, in the pre- and post-2015 periods, the terms of lending of fossil fuel to non-fossil fuel firms based on their climate policy exposure. The year 2015 signals a turning point because of the Paris Agreement and the intensified discussion of a carbon bubble. Our results from the full 2007-2016 sample are consistent with a carbon bubble in the corporate loan market. We find no evidence that banks charge significantly higher loan spreads to fossil fuel firms. We find some evidence for higher loan fees to fossil fuel firms, but even these results are economically small and not robust across different specifications. However, when looking into the post-2015 period, we find the first evidence that banks increased their loan spreads to fossil fuel firms that are significantly exposed to climate policy risk. The economic significance is rather small: a one standard deviation increase in our measure of climate policy exposure implies that risky fossil fuel firms from 2015 onward are, on average, given a 2-basis points higher AISD compared to less-exposed fossil fuel firms, non-fossil fuel firms, and themselves before 2015. To give an impression of the magnitude of this effect, the 2-basis point increase implies an increase in the total cost of the loan with a mean amount ($19 million) and maturity (four years) of around $200,000. Then, we hand collect data on the dollar value of fossil fuel reserves and find that the mean fossil fuel firm in our sample holds approximately $4,679 million in such reserves. Thus, it seems unlikely that the corresponding increase that we identify in the post-2015 period covers the potential losses from stranded assets. We further investigate this finding by using the actual value of the holdings of proved fossil fuel reserves, instead of simply examining average differences between the fossil fuel and non-fossil fuel firms. 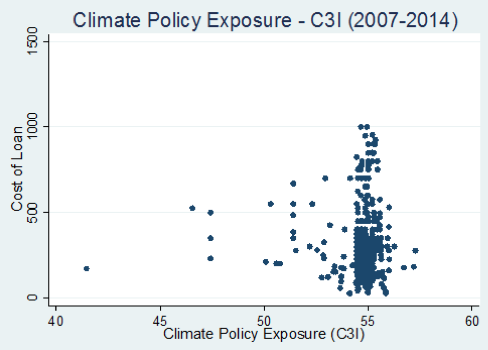 Retaining the dichotomy between the pre-2015 and post-2015 periods, we find that a one standard deviation increase in our measure of climate policy exposure implies an AISD that is higher by approximately 16 basis points for the fossil firm with mean proved reserves scaled by total firm assets in the post-2015 period versus the non-fossil fuel firm. This implies an increase in the total cost of borrowing for the mean loan of $1.5 million. This extra cost of borrowing represents noticeable evidence that banks are aware of the climate policy issue and started pricing the relevant risk post-2015. We also document a direct negative effect of climate policy exposure on the maturity of loans to fossil fuel firms in the post-2015 period.Moreover, we show a tendency of fossil fuel firms to obtain slightly larger loans compared to non-fossil fuel firms when environmental policy becomes more stringent. Even though the respective increase in loan amounts is economically rather small, our finding is in line with a substitution effect due to higher environmental policy risk from ‘lost’ access to equity finance toward bank credit. Finally, we document a slightly higher loan pricing to fossil fuel firms by ‘green banks’ (i.e. those participating in the United Nations Environment Programme Finance Initiative) when climate policy risk increases. Bank of England (2015), The Impact of Climate Change on the UK Insurance Sector, A Climate Change Adaptation Report by the Prudential Regulation Authority. Batten, S, R Sowerbutts, and M Tanaka (2016). “Let’s Talk About the Weather: The Impact of Climate Change on Central Banks”, Staff Report Paper No. 603, Bank of England. Bernauer, T and T Böhmelt (2013), “National Climate Policies in International Comparison: The Climate Change Cooperation Index”, Environmental Science & Policy 25: 196–206. Burck, J, L Hermwille, and C Bals (2016), “CCPI Background and Methodology”, Germanwatch and Climate Action Network Europe. Byrd, J and E S Cooperman (2016), “Ecological Limits, Technology and Stranded Coal Reserve Assets”, Working paper. Carbon Tracker Initiative (2011), Unburnable Carbon –Are the World’s Financial Markets Carrying a Carbon Bubble?, Technical report. Carbon Tracker Initiative (2013) Unburnable Carbon 2013: Wasted Capital and Stranded Assets, Technical report. Carney, M (2015), “Breaking the Tragedy of the Horizon – Climate Change and Financial Stability”, Speech at Lloyd’s of London, 29 September. Delis, M D, K de Greiff and S Ongena (2018), “Being Stranded on the Carbon Bubble? 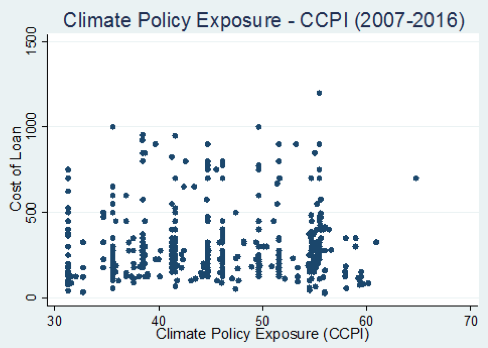 Climate Policy Risk and the Pricing of Bank Loans”, CEPR Discussion Paper No. 12928. Delis, M, I Hasan, and S Ongena (2017), “Democracy and Credit: 'Democracy Doesn't Come Cheap' But at Least Credit to Its Corporations Will Be”, Swiss Finance Institute Research Paper No. 17-14. ESRB (2016), Too Late, Too Sudden: Transition to a Low-Carbon Economy and Systemic Risk, Reports of the Advisory Scientific Committee No 6, ESRB Advisory Scientific Committee. McGlade, C and P Ekins (2015), “The Geographical Distribution of Fossil Fuels Unused When Limiting Global Warming to 2 °C”, Nature 517: 187–190. Schoenmaker, D, R van Tilburg, and H Wijffels (2015), “What Role for Financial Supervisors in Addressing Systemic Environmental Risks?” Sustainable Finance Lab working paper. Weyzig, F, B Kuepper, J W van Gelder, and R van Tilburg (2014), The Price of Doing Too Little Too Late; The Impact of the Carbon Bubble on the EU Financial System, Green New Deal Series volume 11, The Greens/EFA Group – European Parliament.